is also home to the largest collection of 19th century Italianate architecture in the country. 829 west liberty third floor rear my grandmother lived there. Any pictures of the building our surrounding area. I lived at 1335 Main St, may name is Maria Mazzei, Main St looks great, but nothing like it ddi in 1950;'s and 1960' and 1970's could you but some pictures of those years, it would be like home to me. thank you Maria Mazzei Redden. Great to see OTR. I was raised at 1425 Main(1942-1960) close to the old Main theater. 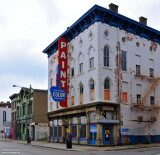 The Main was torn down to widen Liberty St. Long live OTR!! My grandmother lived at 1411 Main st. Do you have any pictures of that building. That was 60 yrs. ago. I am looking for an evangelical church that existed on Tremont Street in the 1940s. A Reverand Krumm was the minister. Can anyone tell me about it? Thanks. these are great. was wondering if you had pictures of 1719 vine where i grew up. would love to see them if you do. or any oh the old st johns church. 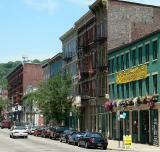 While Over-the-Rhine has its problems, it is hardly the roughest neighborhood in the Midwest. Based on 2007 statistics, Over-the-Rhine wasn't even the roughest neighborhood in Cincinnati. While my photos didn't focus on the more blighted buildings, this is Over-the-Rhine. Look up South Chicago; Gary, Indiana; East St. Louis, Illinois or North City, St. Louis and you will see some of the rougher if not roughest neighborhoods in the Midwest. These photos look amazing, but thats not how it really looks in OTR. Its probably one of the roughest neighborhoods in the midwest..
Oh it looks so beautiful. That make me proud to see that people from my country(Germany) build nice cities in the USA. Dan, So you must be here by now. Send a message and stop by OKI. Over the Rhine is the Crown Jewel of Cincinnati! These images are wonderful, and they make me homesick. What does the rest of it look like nowadays? How much ground is covered here? Are there no pictures of Music Hall on this site? It's such an amazing building, it should be here! I wish we could get some photos of Mulberry Street in this site. Great images! It's such a beautiful neighborhood - I hope one day it can overcome its obstacles and gain a renewed vitality for everyone.